We lost Saturday, Oct 9th last night as we crossed the International Date Line. This morning we pass by Niuafo’ou, an island in Tonga. It is a volcanic island which most recently in 1946 forced evacuation of its inhabitants. We sail quite close to the shore – perhaps within five miles. Thank goodness for image-stabilized telephoto lenses! We have lunch with Donna and Dan in the Rotterdam Dining Room. 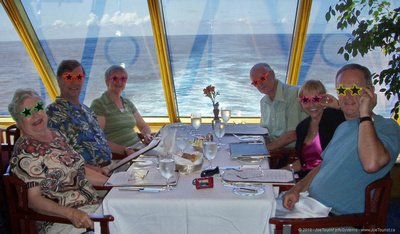 She passes out “star” glasses, which we all don and then ask the waiter take our photo (much to his chagrin). We think it is funny!